Allah created all of us as perfect human beings for Jannah but we are imperfect in this Dunya. Hence in Muslim marriages there are two imperfect people coming together and trying to make it work. It is not easy, nor is it a bed of roses. 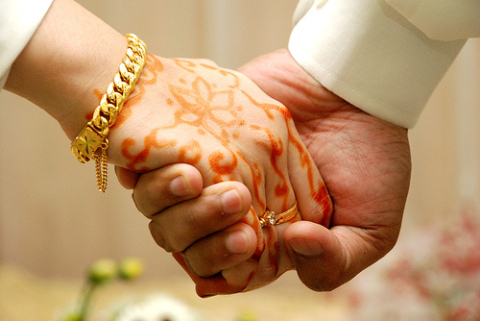 However, Allah has commanded us to live in our marriages with love. He has said in the Quran: "And of His signs is that He created for you from yourselves mates that you may find tranquility in them; and He placed between you affection and mercy. Indeed in that are signs for a people who give thought." In the above verse, Allah does not only talk of affection but He also talks of mercy. Allah says to the Muslims to live with forgiveness and mercy, to accept the flaws of your spouse and be aware that they are not perfect. Love them inspite of them being imperfect and live with them inspite of them not being everything you ever wanted. Your spouse is your partner in good times and bad times. Loving them does not only mean loving them when things are rosy but also loving them when they are down in the dumps, when they are not their best, when they are not beautiful , and when they are full of shortcomings. That is what loving your spouse entails. Loving them when they are angry, when they are mean and caring for them inspite of all these shortcomings. Because Allah has asked us to forgive, compromise and show mercy in our marital relationship. Loving your spouse with imperfections means accepting their mistakes and seeing their sins. And knowing that they still have time to correct themselves. And that you are there with them every step of the way to do so. That you pray to Allah all the time, and you cry raising your hands towards Allah to show them the straight path. You yearn for them day and night despite all these faults. That is what living with your spouse in imperfection is.